Much more than simple garments, our gloves are steeped in tradition. Premium materials from Italy and construction with an eye to intricate detail make the leather gloves in our collection truly tasteful accessories. 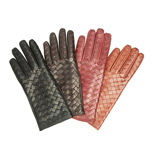 Whether timelessly elegant or stylishly chic, our women’s gloves guarantee perfect warmth, style, and functionality. Sophisticated leather gloves are distinguished by exquisite materials, a meticulously constructed fit, and classic forms. Our collection of fine women’s leather gloves combines high functionality with timeless, elegant designs. The first gloves appeared in prehistoric times. They consisted of furs and hides wrapped around the hands to provide necessary warmth. As such, they served a purely practical purpose. Ancient civilizations such as the Persians, Egyptians, Greeks, and Romans elevated the status of the glove from purely practical hand protection to a marker of style and social standing. For centuries, wearing gloves was a practice limited to men. At the close of the 11th century, women began to wear these practical accessories as well. Initially, women’s gloves were exclusive to nobility. Most of these earliest models covered the entire forearm, and often extended up to the elbow. Soaked in the perfume of their wearers, they also probably served a hygienic purpose—after all, the sanitary issues of those times are well-documented. Gloves reached their pinnacle in the 16th century, when Queen Elizabeth I made a point of donning them to formal functions. The Queen knew how to draw attention to these stylish accessories; she took them off to greet her guests, ensuring a high degree of visibility. In the 17th century glove lengths shrunk to stop at the wrist, where they typically remain today. That being said, longer versions never vanished entirely. While women reached for silk models in the evenings, they made a habit of wearing suede gloves by day. Since that time glove lengths, materials, and colours have been subjected to the vicissitudes of fashion and taste. 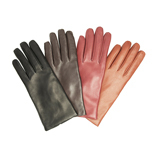 Nevertheless, the glove has remained a staple of both men’s and women’s apparel all the while. Kid leather is very commonly used to make classic gloves. Durability, flexibility, and a pleasantly soft feel number among this natural material’s star attributes—it is the perfect choice for our stylish leather gloves. On their insides, soft and cuddly cashmere lining keeps your hands comfortably warm. 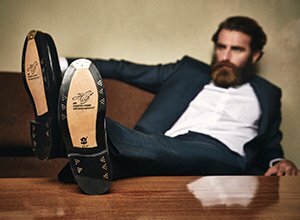 When it comes to particularly cold weather, our models lined with rabbit fur ensure wearing comfort. At the midpoint of the past century, the prevailing dress code still called for a glove to match each time of day. 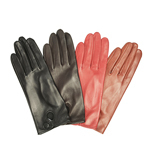 Our classic leather gloves for women thrill with elegant cuts and timeless designs. Stylish details lend tasteful accents to these truly versatile gloves. From purely classic designs, to modern tonal stitching, to pairs with zippers or traditional snap button closures, our collection of women’s leather gloves has something to suit all tastes.